Rescued GSD Daisy - Here is another wonderful German Shepherd rescue story sent in by one of our readers, Christina S. Thanks, Chris! I hope you all enjoy reading it as much as I did. I am Daisy a 6 month-old GSD rescue. I just moved to Old Town Alexandria, VA and love it. When I first moved here it was a huge adjustment from my foster home in the country and 10 other GSD friends. But, there are dogs everywhere and all the people want to meet me. My first night out on the town I learned exactly how exciting of a place Old Town would be, 4 kids and 2 chocolate lab puppies wanted to play and know all about me. Lately, I have been going to class once a week and excelling at everything—or at least my mom thinks so…Except the first night I fell asleep, some man I never met before would not stop talking. I did what any other smart dog would do: curled up, tucked my head under to block the light, and took a nap. 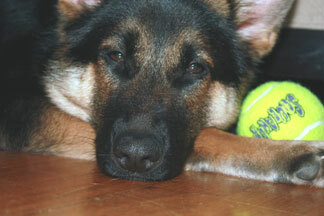 My favorite activity is playing ball…the picture is of me after a good time of playing ball and I needed to sleep. However, I did not want the 4 legged fur ball (AKA the cat) taking my ball away so I kept it safe, right next to me. Hello Chris, Thank you so much for sharing your great story about rescuing your new German Shepherd puppy Daisy. We certainly appreciate you taking the time to share with us both Rescued GSD Daisy story and the cute picture too. And if you get the chance, send us an update in the future. We'd love to hear how far you have progressed and what you have been up to. And to the rest of our readers, please, if you get the chance please leave some comments, we'd love to have you join in with us here and place a video of your own or tell us your own GSD story in our sharing section. We'd also love to see your pictures - after all the German Shepherd is one of the most beautiful dogs on the planet! I'm sure we can all agree on that. Thanks for visiting us here at Total German Shepherd.